The El Camino de Santiago, or the Way of St. James. Whatever you call it, this is going to be one serious pilgrimage. Starting September 21, I will be traveling to Spain for 3 weeks to walk a pilgrimage that has been around since medieval times—over 1000 years ago. There are many paths to get there, but the one we’ll be taking is the “primitivo”, or the “original” path. 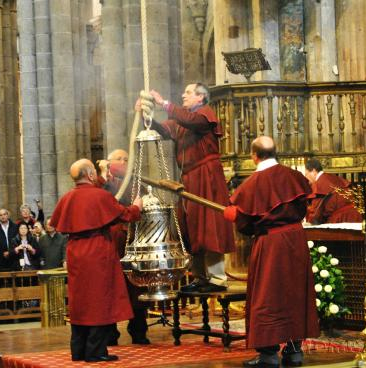 It begins at the Cathedral in Oviedo, and is a 321 km walk to the Cathedral in Santiago de Compostela, which holds the remains of St. James, and houses the world’s largest thurible. It’s been interesting preparing for this trip because, well, I never expected I would have to “train” in order to make a pilgrimage. Because, as I’ve said, we’re walking 321 km, I’ve had to practice going on 30 km walks and notice all the ways in which my body does not want to go on 30 km walks, and to learn how to deal with it. All our luggage is carried on our backs, so you have to pack light and think about what ways you can cut corners in luggage, such as bringing only 2 sets of clothes and alternate between washing one and wearing the other. And even with all the planning that is going into this, I’m sure that when I’m actually there, this trip will likely kick me in the backside anyway. But that, it seems, is part of the whole experience. After all, this is a spiritual journey, and like the spiritual life, we have to exert a lot of effort in planning and training in order to be better prepared to take on life’s adversities, but even so, there will still be surprises, so we need to place all our trust in the Lord so as not to become disheartened or to give up. I feel like God has really had his hand in this whole experience and I’m looking forward to what He wants to tell me on this pilgrimage. I will make sure to share it with everyone upon my return. One of the other big parts of this experience is that people traditionally bring along with them many prayer intentions all the way to the end of the journey. So for that reason, I would like to open this up to anyone who has a prayer intention they want to send my way, to fill out this form so I can have an easy to access, giant list of all the intentions I’m praying for. So if you haven’t already, click here and send me your intentions! St. James, pray for us!!! Fr. Steve. Please add my granddaughter, Isla, who is four, to your prayers. You may remember my daughter, Lisa Clark. Isla is Lisa’s and Greg Carroll’s daughter. Isla has developed a bone infection in her leg.